The National Low Income Housing Coalition (NLIHC) looks forward to working with the 116th Congress to address one of the most critical issues facing extremely low-income families today: the lack of decent, accessible, and affordable housing. Today, just one in four eligible families get the assistance they need to afford a place to call home. With leadership from Congress, we can end family homelessness and housing poverty once and for all. NLIHC is dedicated solely to achieving socially just public policy that ensures people with the lowest incomes in the United States have affordable and decent homes. 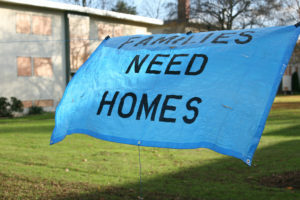 Our members include state and local housing coalitions, nonprofit housing providers, homeless service providers, fair housing organizations, researchers, public housing agencies, private developers and property owners, local and state government agencies, faith-based organizations, residents of public and assisted housing, and concerned citizens. While our members include the spectrum of housing interests, we do not represent any segment of the housing industry. Rather, we work with and on behalf of extremely low-income households who receive or are in need of housing assistance. In the 2018 election, affordable housing was squarely on the agenda in many states and districts. Many newly-elected representatives ran and won on platforms with bold housing solutions — from expanding housing vouchers and increasing funding for the national Housing Trust Fund to new measures to address homelessness. These leaders now join other bipartisan congressional champions of expanding affordable housing investments.